In the U.S., we have the freedom to choose homeschooling as an option to educate our families. But across the world it is not an option for many. And by option, I mean it is illegal to homeschool their children. Can you even imagine being denied this right? To have to take your homeschool “underground”? To have limited or even no textbooks or resources in which to use with your children? I’m overjoyed to have recently had a chance to help families in Asia gain quality homeschooling materials to educate their children! This has provided a great opportunity for more discussion in our home about rights and freedoms. 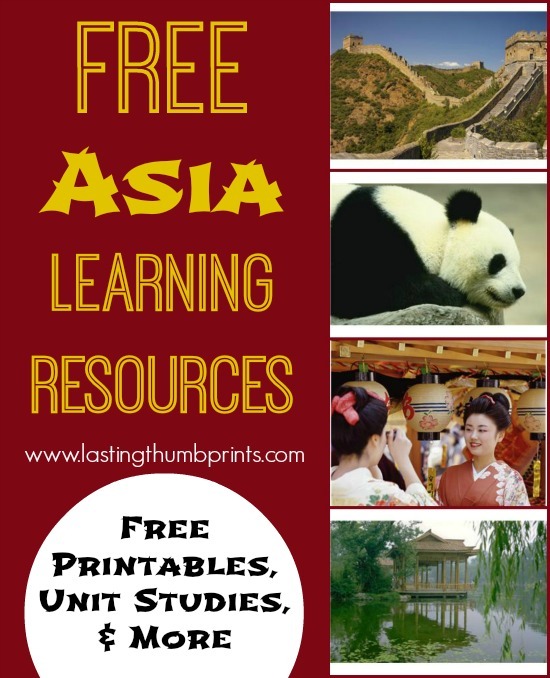 And because I can never turn down an opportunity to link learning with real life, I’ve collected various educational resources for learning about Asia that can stand alone or be compiled into a unit study. This is certainly not an exhaustive list and you won’t find resources for each of the 48 countries that make up the continent of Asia. We’ll be using some of these in the next week or two to gain more knowledge about the families we hope to help. Do a unit study on an animal found in Asian countries like pandas, tigers, elephants, or the rhinoceros. Watch YouTube videos on traditional Asian dance or the different martial arts. Make an authentic recipe from an Asian country. There are so many different arts and crafts projects that could be done. I’ve started collecting ideas which you can check out on my Asia Unit Pinterest Board here. I hope you can find some of these resources useful in your own learning time! Thanks for including me in the list. What an awesome list of resources – and a wonderful cause to support! Thank you for creating such wonderful resources for families! 🙂 Your “Praying through the Produce Aisle” changed my summer homeschool plans.